Anyone with some news on the opening of Romeo's Italian Restaurant, Arepa Lady & Mario's Pizza (former location of Fresh Split Milk)? 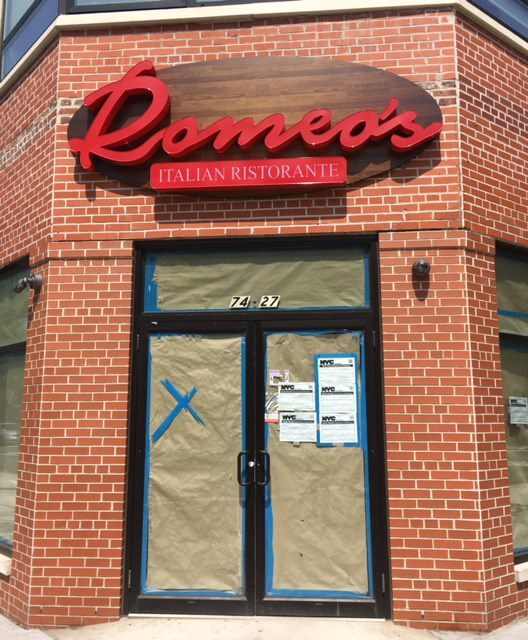 Romeo's began construction in August 2017 so I would imagine they should open soon. Arepa Lady was expected to open late March 2018. What came as a surprise is Mario's Pizza returning. I'm looking forward to all three opening especially Romeo's. On Instagram, on May 3, Arepa Lady said they'd be opening in "hopefully just a couple of weeks." So fingers crossed they are open by the end of the month. I'm not sure how long ago it was installed, but Romeo's has its new sign up. Albeit slowly, things are moving along. Arepa Lady is definitely moving along. the interior doesn't look *finished*, but they've made some major inroads already. haven't been able to see inside Romeo's, but looking forward to seeing what they come up with. Stew’s going head to head against Arepa Lady ( who he previously trashed). My money is on Arepa Lady to survive in “Jackson Heights Restaurant Wars”. Who will be first to get approval from the DOB? Who will get a Michelin star? Who will get their food trashed on JH Life? This and more coming soon on Jackson Heights Life! Fresh Spilt Mil'k now has a sign stating that it will be serving Argentinian pizza. well, if the restaurant thing doesn't work, Stew should think about starting a cult -- judging by the number of people here who've pledged undying loyalty to him without knowing a thing about his culinary skills. THE BEST pizza in the world. Anyone who's been to Buenos Aires would attest to this. I have not been to Buenos Aires, what's the deal with Argentinian pizza? I have written on this forum quite a few times about Argentine pizza. There used to be an Argentinian pizzeria around 2007-2008, which was right at the foot of the 7 train on 90th. It closed and the owner/manager reopened for a short few months in and concurrent with Party Pizza (where Sac's is now). There is a home-style version almost always available at La Gran Uruguaya bakery and also at La Nueva bakery. I can't remember it ever being greasy. It's my favorite of all the everyday-type pizzeria pizzas, i.e. pre-baked, sold by slice, quick, inexpensive. I wouldn't doubt, in fact I hope, it's the same guy opening at the spilt milk address. i love Argentinian pizza -- the style is distinctive, and the pizzaolas really pay attention to the dough, which is neither cracker thin nor sicilian style, almost puffy in a way. it'd be cool if that were the case up the block. Driving to Jamaica Bay yesterday, we passed another Romeo's--maybe in Howard Beach? Not just the same name, it had the same big red signage, only this one said "Romeo's Pizza and Pasta." From what I could see quickly passing by, it seemed like it might be similar to the pizza place in the Roosevelt 74th St station. It didn't look as much like a real Italian restaurant as it did a typical pizza place. But maybe they will be trying something new--who knows. I wonder if there are other locations. Saw some major construction going on at Arepa Lady's new location on Saturday. Brava for making the investment in the neighborhood!!!!! Yes! I'm also looking forward to Arepa Lady's opening. It looks like the two other businesses, Mamma Rosa's pizzeria, and Romeo's are also getting closer to an opening date. Mamma Rosa's has a "now hiring" sign, and Romeo's just had new windows installed. I took a peek at Romeo's interior recently, and noticed how the former Armando's sidewalk seating extension had made a big difference in terms of size. Of course, Romeo's appears smaller, but its brick walls lend kind of a rustic and cozy appeal to the smaller space. Keeping fingers crossed! When I passed by Romeo's tonite, they were working on the windows, door was open, still very bare inside.